The NCSU Libraries works closely with the Chancellor's Faculty Excellence Program (CFEP) and interdisciplinary cluster programs at NC State to support research, teaching, and outreach across disciplines. Contact our librarian liaisons for your cluster area to discuss your collections and research needs. The Faculty Research Commons at the Hunt Library is a comfortably furnished space for faculty to engage in both individual and collaborative work. The space includes a common area and reservable workrooms, focus rooms, and a conference room. At the D. H. Hill Library, there is also a Faculty Research Commons and faculty can apply to use one of the research study rooms for an entire semester. These private rooms are located throughout the bookstacks. 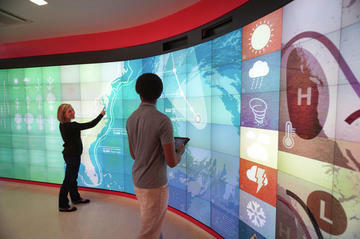 The NCSU Libraries provides spaces for high-definition visualization, simulations, ideation, and innovation. These spaces accommodate various projection and display configurations; real-time video capture, broadcast, and collaboration, and offer new ways to approach public engagement with research. Dedicated videoconferencing spaces are available at the Hunt and Veterinary Medicine Libraries. We can provide assistance with data management planning, discovery and description, sharing, and preservation. Contact us at library_datamanagement@ncsu.edu to set up a consultation or request a workshop. Librarians are available to support your research needs and answer questions. Contact us for one-on-one assistance with literature searching, citation management, measuring your research impact, or finding funding opportunities. The Libraries’ Copyright & Digital Scholarship Center provides guidance on scholarly communication and copyright issues. Do members of your research team need help formulating research strategies or locating needed information? Librarians can provide in-person or online instruction and can assist in developing learning tools for students to use independently. Research workshops are offered on a regular basis covering topics from literature review research to navigating subject specific databases. The library lends electronic devices, including laptops, digital cameras, camcorders, digital voice recorders, graphing calculators, and iPads. Contact our library liaisons for your cluster area to discuss collections needs. Genetics, statistics, mathematics, computer science, and biology. Carbon nanotubes, electronics, nanotechnology, materials science. Analytics, applied mathematics, machine learning, simulation, visualization, and computation. Education and educational policy, social sciences, communication and information technologies, computer science. Plant pathogens and pests, food security, genomics, ecosystem processes. Human health, environmental factors, toxicology, genetics, epidemiology, and bioinformatics. Human remains research, analytical chemistry, forensic statistics, and disaster preparedness. Genetics and genomics, social sciences, public policy, geospatial and numeric data, laboratory protocols. Feature data, satellite imagery, digital orthophotography, and numeric data. Ecosystems and biodiversity, human health and well-being, evolutionary and disease ecology. Water quality management, sanitary engineering, public health and policy, environmental and social sciences. Design, management, business, and engineering. Molecular Biology, chemistry, physics, and cellular engineering. Science communication, STEM education, public policy. Microbiology, microbial ecology, agricultural pests, ecology and genomics. Embryonic development, quantitative and computational biology, evolution and biodiversity. Quantitative methods, research design, and statistical analysis and modeling across clinical and biological sciences. Energy sustainability, public policy, economics, environmental impact assessment. Biomedical engineering, life science, veterinary medicine, and patents. Communication, analytics, data visualization, immersive experience, digital humanities, and computational media.